No one is ever quite the same, Susan Sontag once wrote, when we experience a rare reprieve from the inhibition on love and trust that society places on us. It was just such a reprieve that about 150 people lived through as they spent between 5 and 7 hours exposed to -35 temperatures at a silent sit-in at the War Dept. in downtown Ottawa on Valentine's Day, February 14. As we shivered together at the main DND entrance on Mackenzie Bridge--which we kept closed for almost five hours-- there seemed always a sense that we were together as a newly formed community of mutual aid and trust, taking care of each other and watching out for the signs of too much exposure to the elements. The action, organized by Homes not Bombs, was a colourful, deeply moving expression of love, love of neighbour, love of opponent, love for the targets and victims of war, love for those who make war and are divided from the best parts of themselves. A MESSAGE IS WELL RECEIVED And it was a message that seemed to be taken in by a good many of our potential opponents. Many in the sky high war dept spent the morning not working at their desks on war plans, but staring out their windows, incredulous that scores of people would remain in what one bystander declared must have been the coldest spot in Ottawa, the concrete canyon between the War Dept. and the Rideau Shopping Centre. The lines of Military Police inside the warm building could not help but nod in a kind of fellowship greeting when we waved at them too. Even a cynical local radio reporter, who predicted we wouldn't last more than 20 minutes, seemed to lose her "been there, seen that" attitude as she reported in every half hour until past noon that, despite the cold, we were still there. Many inside the Dept. returned peace signs, others gave thumbs-up signals. There is a photo in the Ottawa Sun of one man high in the building looking down, his face a combination of concern and compassion as he delivers his own thumbs up: he appears to be genuinely affected. Like many of the images we see these anti-war days, the photo has the air of history about it, much like photos of concerned individuals looking out from the Pentagon windows in October 1967, when that building was challenged in another expression of love and resistance to the war against Vietnam. The police and RCMP liaisons appear to have been caught up in the spirit of morning as well; they constantly check in for fears that our group might be undergoing hypothermia and frostbite, and do nothing to stop the 30 minute march which, though well advertised, has no permit from the city. Although they are there clearly in the role of "friendly" cops, there to gather information and help the Ottawa police look good, they are also human beings who are freezing with us and learning something about the power of love and relentless persistence. They are dressed in civilian clothes, and even behave like they are part of the demo. At one early point, when liaisons from the affinity groups are called to a meeting on a strategic question, the two officers try and creep in on the huddle as well. We immediately drop to our knees, explain this is a prayer vigil, and ask for privacy. They respectfully back away as we quietly bend our heads in an air of genuflection and discuss the issue. SOME STILL NEED A CHANGE OF HEART Of course, there are still many who need a change of heart. One of our number, who was blocking a war dept. entrance, stopped a colonel, who backed up and charged full force, knocking the pacifist down. Even the Military Police found this to be completely out of line, and told the demonstrator that he could press charges if he liked. The transformative response caught the MPs off guard: the fellow gave them a statement but said no charges should be laid; rather, he wanted to meet with the colonel and discuss why the military man felt it was necessary to bowl him over. The MPs were a bit taken aback, explained that the colonel was "indisposed," and that perhaps someone would be in touch. Valentine's Day at the War Dept. was the next step in an escalation of actions against the war for some. We point out that we have marched in the streets; we've faxed and e-mailed politicians, we've written letters and sent them snail-mail, we've written letters to the editor, we've held teach-ins and sit-ins, we've presented peace zucchinis, we've urged Canadian soldiers not to fight, we've held citizens weapons inspections at Canadian manufacturers of weapons of mass human destruction and been arrested at two of them; we've worked on municipal anti-war resolutions; we've organized delegations go to Iraq; we've done children's art projects against the war; we've violated the sanctions by sending medicines and clothing to the people of Iraq; we've held sick-ins, calling in sick to work so we can work against war; we've seen public opposition to war grow to encompass the majority of the Canadian people. And yet the government of Canada publicly waffles while: Canadian Generals take part in war planning at U.S. Central Command and 20 of them go to Qatar to continue those unspeakable plans; almost 1,000 Canadian soldiers continue to enforce the sanctions; Canada continues to supply the U.S. military, ranking #46 on the top 100 Pentagon contractors list for 2002; and veterans of the 1991 war against Iraq continue to die of Gulf War Syndrome, with no compensation or assistance from their government. Our conclusion from this has been very clear: the War Dept. needs a change of heart, and our journey to Ottawa ends at the base of military power in this country, the massive concrete structure in the nation's capital. It is a journey that is made from many parts of Ontario and Quebec: Durham, Kitchener, Hamilton, St. Catharines, Kingston, Brampton, Montreal, Hudson, among others. POLICE STOP THE KITCHENER BUS The Kitchener bus is barely out of town before it is stopped by regional police who board the bus, give it a search, including in the bathroom, and then, without explanation, get off the bus. They never say what or whom they're looking for; perhaps it's just a reminder that this will be no ordinary excursion to Ottawa. The bus from Hamilton, along with its Kitchener and Toronto counterparts, will watch videos of prior Homes not Bombs actions to give folks a sense of what things we've done and how we've done then; there is an extensive clip from the 1999 effort to turn the war dept. into to the housing dept., a historic action which saw 55 arrests and a civil society built at its entrance--an apartment with fridges and stove and couches and a bed, daycare, community garden; clips from the ultimately successful 3-year campaign to close to Hamilton war show; the attempts to transform weaponsmaker Diemaco in Kitchener into Lifemaco the community builder; the Wizard of DREO, when a Cowardly lion, brainless scarecrow and heartless tinman joined Dorothy and other characters to transform Canada's space warfare facility in Nepean; and recent weapons inspections at the Northrop Grumman and Wescam war plants in Rexdale and Burlington, respectively, which saw 11 inspectors arrested. It gives folks a sense of their history, of the history they carry when they too act and make history of their own. It also helps build a sense of confidence and trust, showing how folks have found powerful nonviolent ways of confronting lines of riot police and disarming them through persistent efforts at dialogue and expressions of love. 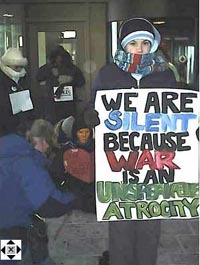 It is also a reminder of how far we have come; there are only a few anti-war veterans here who were present during a massive blockade of External Affairs during Gulf War 1, a similarly brutal day weatherwise when some 400 people suffered through four hours in -40 temps, roughhousing courtesy of the RCMP, and some arrests too. There are many more from the historic 1999 War Dept. gathering in which all 55 arrested on the Mackenzie Bridge were acquitted. That landmark judicial decision, issued by Judge Fontana, has gone on to be used as a precedent for other acquittals. 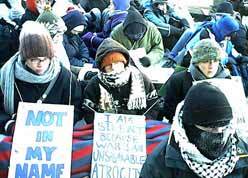 Its spirit also seems to have contributed to our efforts to expand the outer perimeters of dissent which cannot be criminalized in Ottawa, for in 2003, we close that same bridge almost five hours, with no arrests. Indeed, while some feel thankful the police did not arrest us or try to stop us from getting on and occupying the bridge, it's not necessarily because the police don't want to take those actions; rather, it's because they feel they cannot, because of the victory we won through our 1999 effort. One can see then that our choice to exercise our democratic rights, even if it means being arrested and jailed, ultimately ensures the survival and, hopefully, expansion of those rights, not just for demonstrators, but for everyone. CITY OF OTTAWA THREATENS MASS ARRESTS But we don't know the Ottawa police will be forced to respect our democratic expression the night before the action. And so there is a bit of that creative tension in the air as people pile into the church to the wonderful aroma of big pots of soup, some of them donated throughout the afternoon, that are warming for dinner. The air is filled with the sounds of people preparing for a party; a stranger walking in might not have known that a good many of the people making beautiful placards and banners were also filling out jail support sheets in preparation for a spell of incarceration. Through laughter and song, a large group of people, many meeting for the first time, are beginning to feel comfortable with each other, and a growing sense of trust, and love, begins to fill the church hall. After dinner, we are joined in the church sanctuary by Ottawa residents who are coming to talk about the action. We embark on a four hour scenario meeting, a painstakingly detailed community hall that, as one woman pointed out, is what democracy truly does look like--it takes a long time, and it can be frustrating at times, but it is vital to try and incorporate and respect everyone's concerns, whether we are forming a community or preparing from a confrontation. The meeting begins with a welcome from Rev. Karen Niven-Wigston of Wesley United Church, who has done so much in her community to live out the social justice message of the Gospel and who has done so much to help us be welcomed in Ottawa at a number of churches. Outside her church, and at Canadian Martyrs where we also stay, is a huge sign which reads "Swords into Ploughshares, We are a peace church." These signs too have an air of history about them. She is followed by Mary Foster of the Iraq Peace Team, just back 24 hours earlier from her trip to Iraq. She shares with us a Valentine from a six-year-old Iraqi boy which she will bring to the war dept. the next am. Mary then introduces Louise Richard, a former Canadian Forces nurse deployed to the Gulf in 1991 and now afflicted with Gulf War Syndrome, a passionate advocate for the rights of disabled vets and a persistent voice for justice. She speaks of the effects of Depleted uranium not only on vets but on all the people of Iraq, and pledges her support to the action. We haven't even dealt with the needs of the 1991 vets, she points out, and here we are sending a new generation into the line of fire. We then go through the long process of every possible scenario which might greet us the next morning. Part of preparing a confrontation, it seems, is creating a space for accountability, so everyone taking part knows what to expect from everyone else. If we are prepared for surprises, we won't be broken up when they happen. 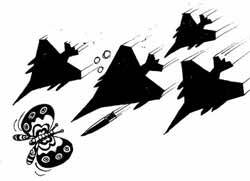 The big issues are whether we feel comfortable with one or two groups blocking entrances to the war dept,. and then with the concept of silence. Should we speak to the media, should we break up the silence, should we stay silent. We break into affinity groups, we do some roleplays to show what a physical blockade might look like when done in silence. We discuss how we will respond if police stop out march before the bridge, and whether we should block the whole bridge or part of it. We set up liaisons from affinity groups so that we can call a quick meeting if something unexpected or new arises. We also agree our only sounds will be moments of "critical whispering" to address a crisis. But many are adamant: we came because of the power of silence, and we intend to keep it that way. The messages from the authorities are mixed. The City of Ottawa faxes us a three page warning that our march and silent sit-in violate their special events by law and that swift action will be taken to clear us from the streets (that's the hope anyway, we joke, for the last thing we need is to be exposed to hypothermia and frostbite for five hours). We break into legal support and medical teams, and by midnight most people are asleep on the church floors. But people still come, driving all night from Hamilton, Brampton, Peterborough, Montreal, some arriving at 5 am, just in time to start breakfast. As we rise from a night on the church floor, some reporters come in to introduce themselves. One states his station's morning DJ, normally not the most progressive of sorts, has told his listeners that there will be a major traffic disruption in downtown Ottawa, but that those doing the demo are peaceful people. They will be inconveniencing you, but you should think about what they are doing and why and, even if you disagree with them, respect their commitment. Journalists from a variety of media quietly express their support as well, and hope we will stay warm. A SILENT SIT-IN BEGINS The group heads out from Main and Lees on the east side of the Rideau Canal at 7 am and, without a permit, takes over the streets and walks up Elgin to the Mackenzie Bridge which abuts the north side of the War Dept. Police appear unwilling to stop the march, and simply follow it, blocking cross traffic intersections to keep the march moving through. When we arrive at the entrance to the War Dept., Mary Foster speaks poignantly, passionately, of her recent trip to Iraq as part of the Iraq Peace Team. "I met many of the people who are going to die and who will have their children killed," she tells us as she holds up her Valentine, drawn by six-year-old Omer in Baghdad. She says millions of words have been said about Iraq, but lost in all this media noise are the voices of the Iraqi people themselves--so perhaps, if we were silent, we too, and maybe the folks in the war dept. might actually hear them. Foster closes by reminding us of the unspeakable atrocity of war to explain why we will be silent, and within seconds, the only remaining sound is the wind whipping through the area and the chatter of nervous journalists, dumbfounded that no one is granting them interview requests because our verbal statement has already been made, and now the statement made by our silent, determined bodies will have to suffice. One TV journalist, being followed by a couple of journalism students making a documentary on the news, complains that "this is TV, for god's sake, what am I supposed to do? I suppose I can surmise this is an anti-war demonstration, but how I am supposed to cover this in a visual medium" The media will not control the message getting out today, we will, and the reporter's complaint seems pointless, as the visual imagery of the silent group, including the amazing placards and banners which display our message, speaks volumes. As does the fact that some 50 of our number are prepared to be hauled away by morning's end and placed behind bars to stop this war. After a half hour of silence, a small group moves toward the main entrance of the War Dept. and stands in the doorways, impeding access. Two lines of Military Police stand at alert on the inside of the warm building, but take no action. Ottawa police, in scarce numbers, look on, but take no action. Eventually, chalk comes out and the hoarding around the front of the building is decorated with anti-war pleas; body outlines are painted on the bridge so people in the tower can see images like those likely to be seen if Baghdad is incinerated by the "shock and awe" strategy planned by Canada, the U.S. and U.K. The idea of a warming centre in the Rideau Centre and in OC Transpo shelters comes to naught as all doors are locked. Everyone from toddlers to people in their 80s is forced to stay out in the cold for two hours, until seriously concerned police convince the Rideau Centre to open its doors--significant security is there to guard the palace of commercialism, just as the war dept. is there across the street to guard the palaces of capitalism. The morning goes on, painfully slow, painfully cold, but if anyone were asked how they were doing, the response would be the same: this is nothing compared to what the people of Iraq have faced and continue to face. After almost three hours of silence, we consense that we need to break our silence to have a community meeting on the bridge to decide what to do next. There is a proposal to escalate the blockade of the doors, which has grown to the Laurier bridge entrance, and one to march on Parliament Hill. Much discussion ensues, with some choosing the blockade, some choosing the march, some choosing to return to the church. In the end, the majority of people choose to walk off the bridge shortly before noon, while a couple of groups continue blockading entrances until 2 pm. As we warm up at the church, many sit transfixed before the radio broadcast of the UN report delivered by Hans Blix and the Security Council's response. The broadcast refers to our demonstration and the millions planning to march on the weekend, and there is a sense of hope: we are contributing to the growing impediments to an escalation of this war. We discuss our plans to carry on the resistance, at military bases, at the upcoming CANSEC weapons show in Ottawa, in the courts as our weapons inspectors go up on numerous charges, and in solidarity with the disappeared of Canada who are behind bars because of their Arabic and/or Middle Eastern heritage and Muslim faith. Folks board their buses for home and catch up on some much needed rest. As many prepare to join the largest mass gatherings for peace in human history to take place the next morning, it feels like we are part of a growing community of resistance which has gone through a challenging patch and committed itself to going forward, together. If you would like to contribute to the costs of our all-volunteer organized action (food, buses, photocopying, etc, for which we took a bit of a bath), please forward donations to Homes not Bombs at the above address.